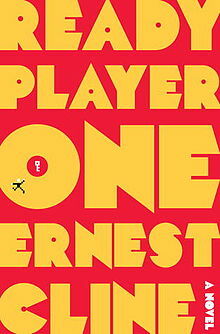 Ready Player One is precisely calculated to make geeks and nerds slap themselves in the face with joy. So it's the not-so-distant future, society's decayed quite a bit, primarily because of an energy crisis (those fossil fuels that take millions of years to make? yeah, we ran out of them), and our hero, Wade Watts, lives in a futuristic trailer park known as "the stacks" (because...they stack trailers). He's obsessed with winning a contest begun by the world's greatest video game designer, recently deceased and worth ridiculous amounts of money (which is the prize, btw). What game did he design? Oh, ONLY THE OASIS, which is like World of Warcraft and The Sims, but way way awesomer? Look guys, the last video game system I played was the Super Nintendo. This is not my area of expertise. Basically the OASIS is an immersive virtual reality, and totally amazing and people spend all their time there because HEY real life is depressing. And rather than spend a lot of time talking about how unfortunate it is that people aren't living in reality, the book is pretty much like "LOOK AT ALL THIS AWESOME STUFF THE OASIS HAS -- LOOK I'M A WIZARD NOW." So the contest for all this money and power and so forth is that you have to find the Egg. An Easter Egg hidden in the OASIS. But you have to find three keys and go through three gates first. And each one has a challenge associated with it, all of which involve '80s pop culture. Oh yeah, the super-rich video game guy was obsessed with the '80s, so HELLO BLADE RUNNER. The entire novel is pretty much references to tv, movies, music and video games, so I fricking love this book. Does the author repeat information a lot in the beginning? Yes. Is his flirting with the "hopefully a girl" girl he meets in the OASIS super-nerdy and very very very much what guys into MMORPGs say? Yes (he calls her "enchanting" -- no one should say this who isn't a skeezy Nazi trying to be smooth with the hero's ladyfriend). But oh, oh the friendships! Oh the Star Wars planet where you can visit Uncle Owen's moisture farm! The daring escapades! The evil corporation that tries to win the contest! The cliched Monty Python and the Holy Grail references! Even with some rough patches in terms of style/writing, I LOVED this book. My only quibble was that there were no Doctor Who references. And sure, you can say "Well, you can't include ALL nerd culture," but IT'S DOCTOR WHO. This isn't like fricking Babylon 5. Doctor Who. It owns nerdery. But this is ok. Because the author obviously has a liking for Japanese culture, and THOSE references take up a decent amount of space. To each his own (even if it's the wrong own). If you really, really like books that make pop culture references, and if you don't hate video games, here is the book for you. ALL THE '80s THINGS. Read it. Enjoy it. Talk to me about how Star Wars is better than Star Trek (even though the two shouldn't be compared).